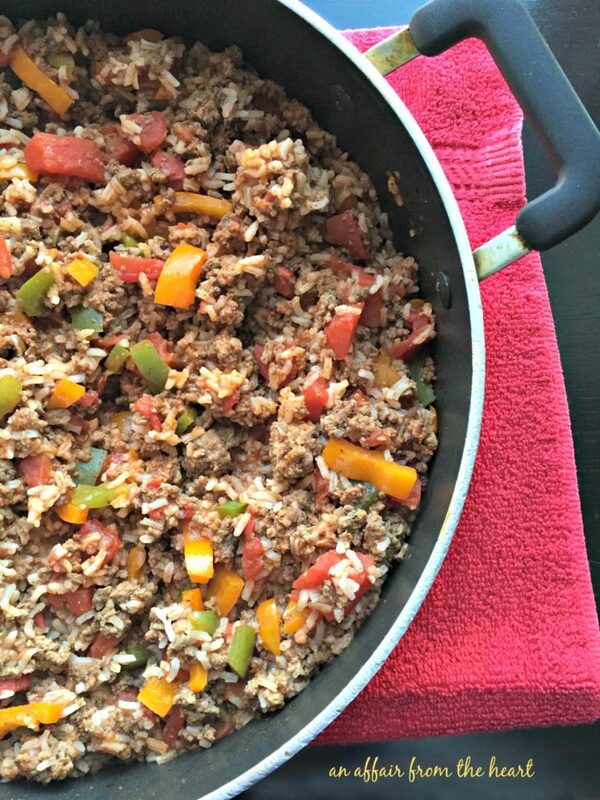 Stuffed Pepper Skillet - an Easy Weeknight Meal we all love. This STUFFED PEPPER SKILLET has all of the flavors of traditional stuffed peppers, with hardly any work. 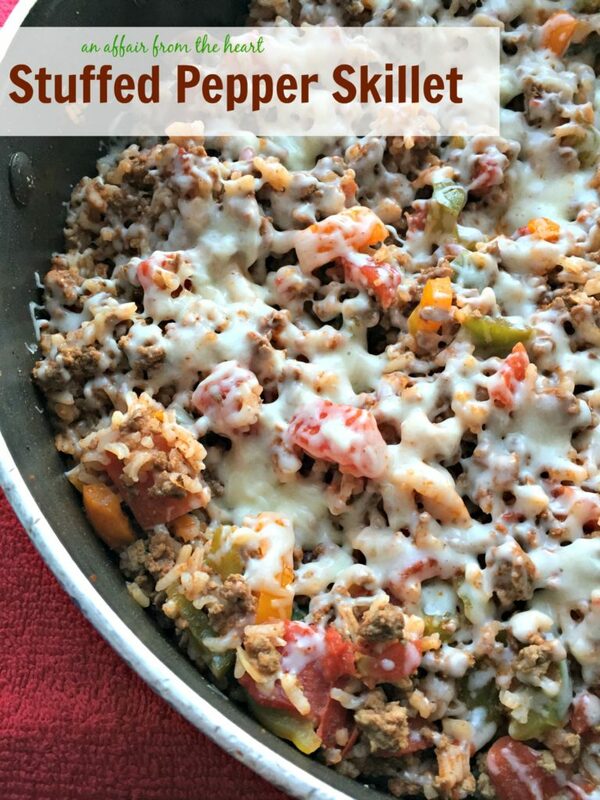 Ground beef, bell peppers, tomatoes, rice and cheese, a one pot simple meal that can be served right out of the skillet, in less than 30 minutes! A couple of weeks ago, I had promised my son I would make stuffed peppers for dinner. I typically will assemble them after lunch and have them ready to go in the oven on time bake while I am doing the afternoon school pick up. When at noon, the power went out. That will happen from time to time, and usually it comes right back on. It was out for 4 1/2 hours! Just when I was about to order a pizza, I got an idea. I would make them right on the stove, in a skillet. 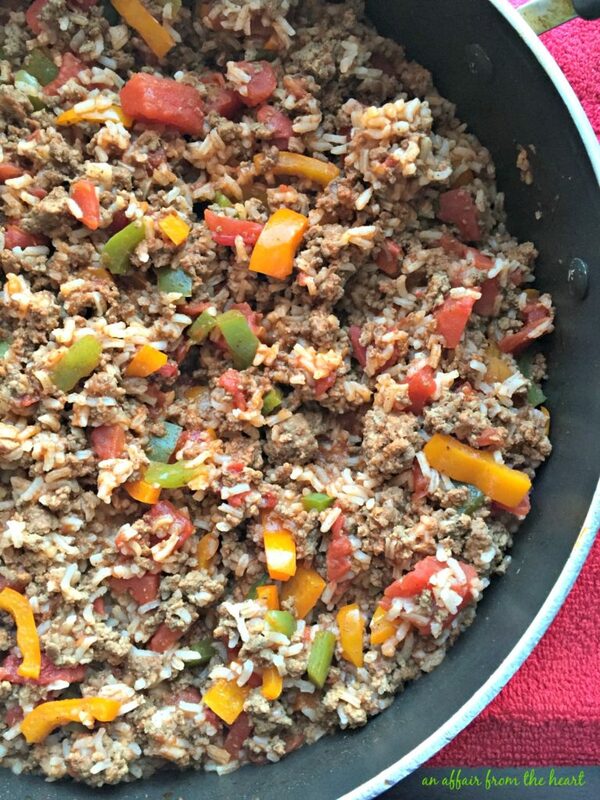 Brown the ground beef with some onion and salt and pepper, dump in bell peppers, tomatoes and rice, and you are well on your way. Cover and let it simmer until the rice is cooked, and dinner is served in about 30 minutes. Top it with cheese if you want, it was good either way. One pot, fresh ingredients, easy prep and ready in about 30 minutes — doesn’t get much better than that! You can use whatever colors of bell peppers you like — I think it looks so much prettier when you use an assortment! In a large skillet, brown ground beef with onion, seasoned with salt & pepper. Drain any excess grease. Add to the skillet the rest of the ingredients (except cheese) Cover and simmer until rice is cooked, about 20 minutes or so, stirring occasionally. Top with cheese if desired. When it's melted, serve right out of the skillet. We love Stuffed Peppers so much — the next one I can’t wait to try is this Italian Stuffed Pepper Cauliflower Rice Skillet from Lisa’s Dinnertime Dish! I see the recipe calls for instant rice. Instant rice cooks in 5 minutes. Won’t the rice get sticky if it cooks for 20 minutes? Did you mean to say regardless rice or ling or short grain rice instead of instant? I don’t mean to make things complicated. Thank you and please let me know because I would love to make this. Also it takes the same amount of liquid as it does instant rice. It seems lik see there is almost twice the liquid being added. It took about 15-20 minutes for the rice not to be crunchy. I added a little extra water because I like it a little saucier. Feel free to adapt as needed. I used white Minute Rice. Looks really good. Is that 2 pounds of ground beef? Thank you. I don’t. This was literally something I threw together last minute and shared because it was delicious! Make sure you added the liquid, and the pan is covered. You’re using minute rice, right? Try adding more liquid and cook it longer. Keep the lid on and stir occasionally so it doesn’t stick. It needs to steam to cook the rice. That will certainly change the cooking time. Add a little more liquid and turn down lower. Cook til the rice is done. I hope that helps! I had some ingredients in my fridge to use (ground beef, bell peppers, etc.). I came across this recipe and although I had to modify it a bit, it was wonderful! I prefer more veggies and less beef, so I used half the beef but the same amount of peppers and onions. I added jalapeno and garlic. I had a bit of fresh salsa so I just threw that in as well. I skipped the water because I didn’t have any rice, but I did have some Spanish rice that I added to each bowl. This was so yummy. Trust me, I am not a very good cook, so it helps when I can find simple but delicious recipes that I am actually able to follow (my fumbling modifications were only because I had to use some items or throw them away, otherwise I would have followed this recipe to the letter). Thanks for posting this! Thank you for taking the time to let me know that you enjoyed the recipe! Making it your own is what is fun about cooking! Your twist on my recipe sounded really yummy! We had something similar when I was growing up; but no “peppers” for our family! Now one of my favorites, I have thought from time to time of doing “stuffed peppers” this way ! Loved this. I used brown rice instead of white and tossed in a little Italian Seasoning. Came out great. Thanks! Just pre-cook the rice in rice cooker and your done in less time!!!!!!!!!!!!!!!!!!!!!! I made this a couple weeks ago and it was wonderful. I followed the recipe precisely and the results were outstanding. My question is: can I make this in the slow cooker? I have never tried it, I would think it could be done, but the peppers will be softer. Well, I’m going to try it tomorrow and I’ll let you know how it turns out. I’m not a fan of rice and my husband is allergic to tomatoes can those be eliminated and still make a tummy meal ? Would love to try this recipe ! Lisa, You could? But it wouldn’t be anything like this? 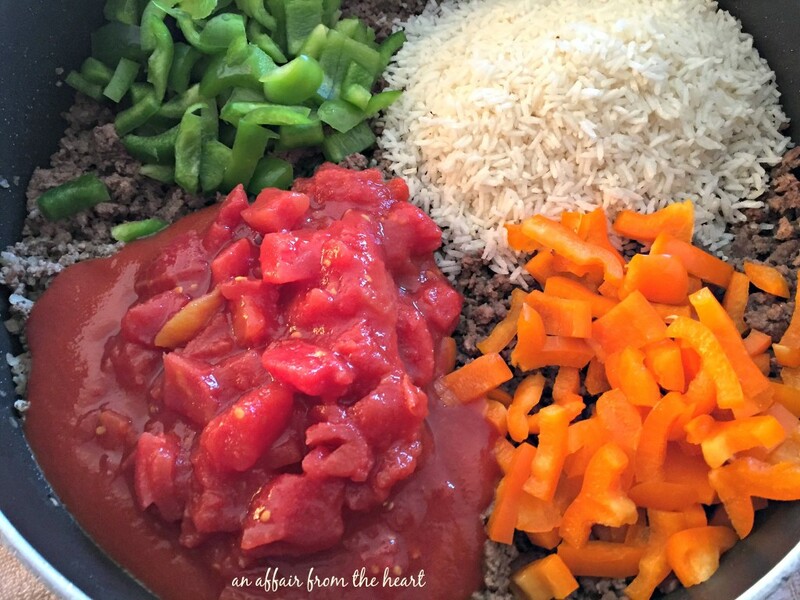 The base is tomato and the rice is what absorbs the liquid — I have another stuffed Pepper recipe called Philly Cheese Steak Stuffed Peppers that uses no tomato or rice? Maybe you would like that? This is my kind of meal all in one pan! WOW! No wonder this is one of your popular recipes, Michaela! Sounds so decadent! Love one pot easy meals. Looks good. Looking forward to trying this soon. Looks delicious and easy to prepare. Thank you! I hope you love it! Please come back and share? I made this about a month ago. It was a HUGE hit! I decided this morning I was hungry for this skillet and spent way more time than I ‘d care to admit scouring the internet in search of your page 😉 Anyway, thank you for the amazing, super easy, recipe. It’s now bookmarked! I love stuffed peppers and this is so easy to make. Thanks for the creative and delicious recipe! 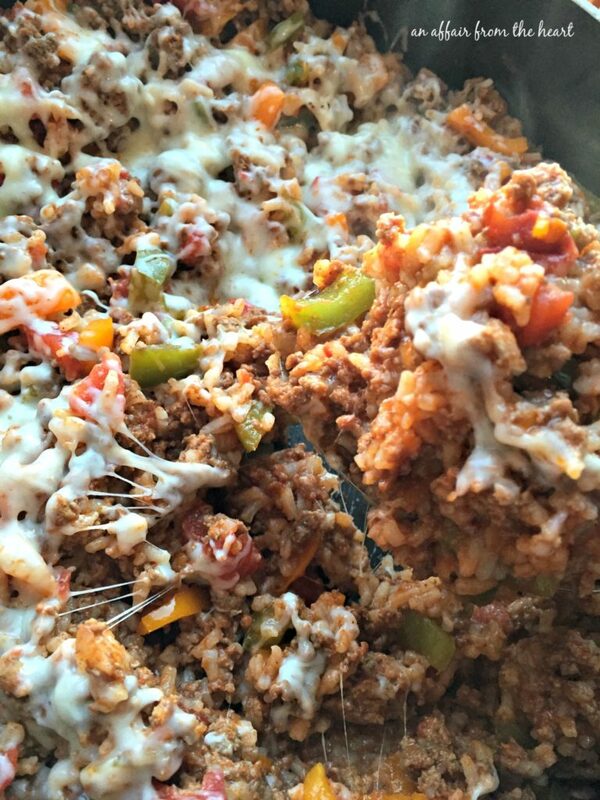 This skillet meal looks so good and I love how easy it is! 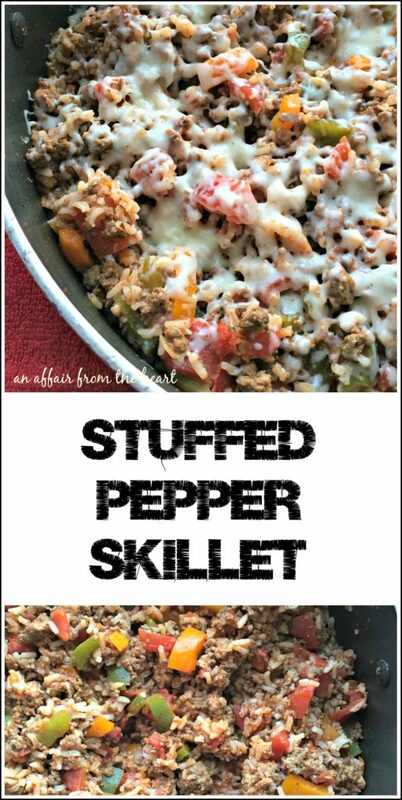 My kids complain when they see a whole bell pepper stuffed on a plate but this recipe is super kid friendly. I know they will devoured it and ask for seconds! This is making me seriously hungry! It looks so cheesy and good and I love that it’s ready in 30 minutes! You had me at hardly any work! This skillet meal is going on our meal rotation. Delish and so simple! Made this yesterday and it was delicious!! Thanks so much! Am thrilled you loved it!! Stuffed peppers for the win everytime! This sounds like the perfect comfort food! I love this spin on stuffed peppers! I have always loved stuffed peppers and Brooks is not a fan because he doesn’t usually eat rice. My mom always made them with green peppers because she was cheap but I love mine with red and yellow peppers instead! This is so good! Tastes just like stuffed bell peppers. I did add minced garlic just because I add garlic to everything lol.